Anyone looking for a premium compact hatchback that's also a plug-in hybrid need look no further than the 2018 Audi A3 Sportback E-tron. The 2018 Audi A3, in sedan or cabriolet form, brings premium qualities to petite dimensions. Car enthusiasts often complain about growing cars, but there's a benefit. 2015 Audi A3 vs. 2015 Mercedes-Benz CLA-Class: Which Is Better? We're comparing two of today's top entry-level luxury cars -- the Audi A3 and the Mercedes-Benz CLA-Class -- to see which is better. The 2019 Audi A3 comes as a premium subcompact sedan or a 2-door/4-seat convertible (called a cabriolet). The sedan is the gateway to brand-new Audi ownership. All those familiar Audi characteristics are in evidence. The A3 has neat styling for both the exterior and interior, high-quality materials assembled to luxury car standards and a confidence-inspiring driving experience. The same goes for the cabriolet, except that it's also a fun soft-top runaround. This generation of A3 is due replacement soon, however. It's a situation that brings positives, as well as negatives. Some buyers will want to wait and see how the new model looks and behaves (probably better than this one), while others may take advantage of the relatively timeless styling and negotiate a cool deal on the outgoing model. The broader A3 range includes a hot S3 sedan (reviewed separately), and the even hotter RS3 sedan (which also has its own review). The entry level Premium trim gains Apple CarPlay/Android Auto smartphone integration and a new design of 5-spoke/17-in alloy wheels. Premium Plus receives full LED headlights, wireless charging and a signal booster. The Prestige trim now has a self-steering parking system. Cabriolet (convertible) models get high-gloss aluminum window surrounds as standard. The optional Convenience package now includes blind spot monitoring, LED interior lighting and high-gloss aluminum window surrounds. The A3 E-tron Sportback plug-in hybrid hatchback has been discontinued. The basic 2.0-liter turbocharged 4-cylinder engine is found in front-wheel-drive versions. It produces 184 horsepower and 221 lb-ft of torque and is linked to a 7-speed dual-clutch (automated manual) transmission. 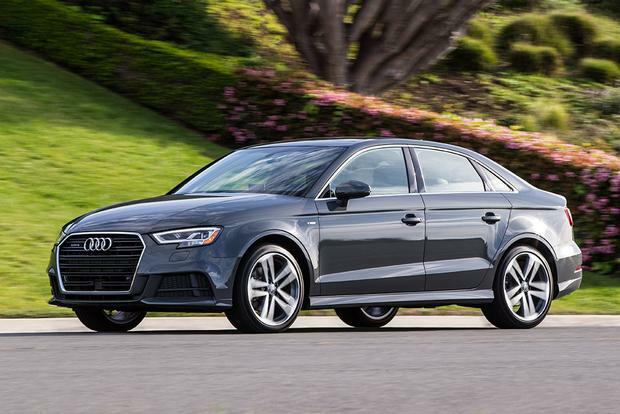 Environmental Protection Agency (EPA) fuel consumption estimates for the 2019 A3 were unavailable at the time of compiling this review, but last year's figures -- 26 miles per gallon in the city, 35 mpg on the highway and 29 mpg in combined driving -- should be close enough. The 2018 cabriolet version achieved 25 mpg city/33 mpg hwy/28 mpg combined. Quattro all-wheel-drive versions have a more powerful turbocharged 2.0-liter inline 4-cylinder engine that develops 220 hp and 258 lb-ft of torque. The transmission here is a 6-speed dual-clutch unit and the (2018) EPA rating is 24 mpg city/31 mpg hwy/27 mpg combined for the sedan, or 22 mpg city/30 mpg hwy/25 mpg combined for the cabriolet. Both engines have a stop/start feature. The 2019 Audi A3 comes in Premium, Premium Plus or Prestige trims. Adding AWD and the more powerful engine costs around $3,000. The 2.0T Premium ($33,495) has leather seating surfaces, 17-in alloy wheels, a panoramic sunroof (sedan only, as the cabriolet has a power-folding fabric roof), an 8-way power adjustable driver's seat, heated front seats, xenon headlights with LED running daytime lights and LED taillights, 60/40 split/folding rear seats, dual-zone automatic climate control, parking sensors front and rear, a rearview camera, rain-sensing wipers, heated mirrors, forward-collision warning, a 7-in screen for the Multi-Media Interface (MMI), Apple CarPlay/Android Auto smartphone integration, two USB ports, SD card slot, Bluetooth, a 9-speaker audio system and HD/satellite radio. A Convenience package brings keyless/entry ignition, blind spot monitoring, LED interior lighting and high-gloss aluminum window surrounds. The Premium Plus ($37,495) adds 18-in alloy wheels, full LED headlights, keyless entry/ignition, an 8-way power-adjustable front passenger seat, a self-dimming rearview mirror, parking sensors front and rear, blind spot monitoring and the "S line" cosmetic package. The Premium Plus trim level is eligible for an optional Technology package that brings active lane assist, adaptive cruise control, navigation, Audi's Virtual Cockpit (a 12.3-inch configurable LCD screen replacing the traditional instrument cluster) and a Bang & Olufsen audio upgrade. The Prestige ($42,695) comes with the Technology package's features as standard. Other equipment includes self-dimming/power-folding side mirrors, parking assistance, Wi-Fi, gesture control for the infotainment system and a 14-speaker/705-watt Bang & Olufsen sound system. The FWD 2019 A3 Cabriolet's prices go from $39,895 to $48,095. A Sport package contains sport seats, Audi Drive Select (separate driving modes from Comfort to Sport) and a flat-bottomed steering wheel with paddle shifters. A lowered sport suspension and rear-passenger thorax/side airbags are also available. The sedan's trunk space measures 12.3 cu ft., although the AWD hardware knocks that down to 10 cu ft. That's still easily enough for a couple of golf bags. The cabriolet offers 9.9 cu ft. with the roof up or 7.1 cu ft. when it's folded away. Thanks to its chassis and airbag setup (which includes knee airbags for the front occupants, plus side airbags with inflatable curtains), the A3 sedan earned a Top Safety Pick Plus accolade from the Insurance Institute for Highway Safety (IIHS), with top scores of "Good" across the board. The National Highway Traffic Safety Administration (NHTSA) gave the sedan a maximum five stars overall, with four stars for front impact protection, five for side impacts and four in the rollover test. The cabriolet has not been crash tested. Although its interior comes across as somewhat small, the A3 sedan feels well-proportioned and has sufficient rear room to encourage prolonged drives with four passengers, largely thanks to the car's more conventional C-pillar, which doesn't emulate the coupe-like look currently in fashion. Extensive use of aluminum helps keep a check on weight, so acceleration and handling benefit significantly. When enhanced by AWD, the A3 tackles twisty roads with strong grip and precise changes of direction. Body control is excellent, making the A3 feel as capable of attacking a curvy canyon road as a sports car. The soft-top cabriolet seats four (as opposed to the sedan's five), but accommodation in the back is limited by needing somewhere to stow the folded roof. When the roof is up, it does a good job of keeping noise at civilized levels. 2019 Acura ILX -- Sedan only. Revised for 2019. Hard to shake the idea that this is really just a posh Honda Civic. Keenly priced from around $27,000. 2019 BMW 230i -- BMW has a compelling package with its 2 Series, which comes in couple or convertible form. Pricier than the A3, though. 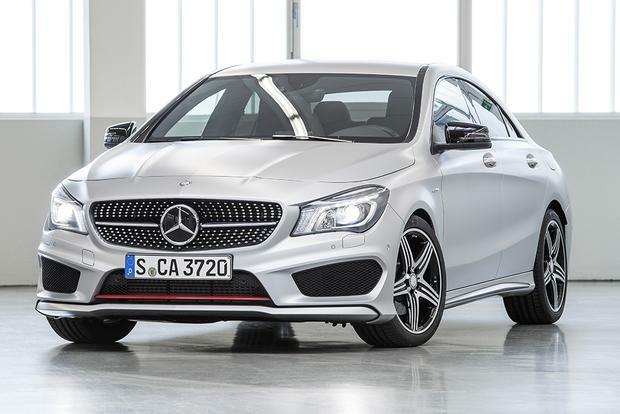 2019 Mercedes-Benz CLA-Class -- Stylish and one of the less expensive ways to own a new Benz. Cramped in the back, however, and a revised version is due 2020. Used BMW 3 Series -- For the cost of a new A3, a recent certified pre-owned (CPO) 3 Series offers more space, plenty of driving fun and just as much Euro-style status. Some things are too good to do without. The Virtual Cockpit is reason enough to get the Technology package that accompanies the Premium Plus trim. Buyers can make up their own minds if they want a metal roof or not. A new generation is expected for 2020.